The Gateway Center event room was filled March 26 to hear Dr. Donald Stewart, a professor in the Department of Environmental and Forest Biology, speak about his discovery of a new species of Arapaima and related conservation efforts. Arapaima are obligate air-breathing Amazonian fishes that can reach up to 10 feet in length and weigh up to 400 pounds. They would drown without surface air since the gills are essentially dysfunctional. Known to live only in freshwater, they are thought to be "swamp fishes" throughout the Amazon because of their preference for quiet, shallow water where they breathe air every five to 20 minutes. "This is a talk about conventional wisdom," began Stewart, who said untested beliefs might have contributed to excessive harvests of some unrecognized Arapaima species. Much of the confusion dates back to 1868, when scientist Albert Günther wrote a paper saying there was only one kind of Arapaima as opposed to the four species originally recognized in the mid-1800s. This belief prevailed until 2013, Stewart said. "Until 2013, the scientific community believed him. Or at least if they didn't believe him, they didn't check it out," said Stewart, who set out to test Günther's claim. His research involved examining fishes preserved from the 1800s and studying decades-old papers and notebooks. "You won't find out about that in Google scholar. You have to go in the old books," he said. 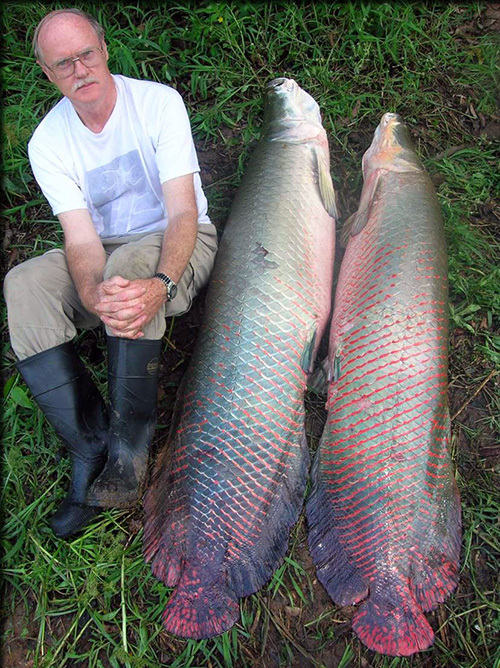 There were four Arapaima species described in the 1800s with different characteristics that allow Stewart to classify them separately: Arapaima gigas, Arapaima mapae, Arapaima agassizii, and Arapaima arapaima. For example, the Arapaima gigas has two rows of big teeth compared to the Arapaima mapae's one row of small teeth on the lower jaw, a difference that is visible to the naked eye. There is one known specimen of Arapaima gigas at the National Museum of Natural History in Paris. "I was the first scientist to look at it since 1847," said Stewart. "It was there. It was on the shelf. Nobody bothered to look." The only known Arapaima mapae specimen is in the same museum. In contrast, Arapaima agassizii is recognized only through skeletal drawings; there are no preserved specimens. Finally, A. arapaima was known from one museum specimen, but that specimen is now lost; so that species is being redescribed based on freshly collected specimens from Guyana. Stewart recently described a fifth species, Arapaima leptosoma from the central Amazon, and continues his research to better understand all the species and their diversity. Current studies focus on an area in the lower Amazon near Santarem, Brazil, as well as in the Peruvian Amazon. Stewart said, "The indigenous people in Guyana call Arapaima arapaima the 'mother of all fishes,'" and he noted that, because of that cultural norm, the local residents mostly left the Arapaima alone. He cautions, however, that more recently poachers present a threat to that species: "It's on thin ice if the poachers want to get a little aggressive." The fish are often poached before they are able to mature and spawn. At that point in their lives, they can provide fishermen with plenty of meat because of what Stewart refers to as their "explosive growth." They grow to be about 5 feet in just three to five years. Stewart said that in many areas 80 to 90 percent are killed long before they mature, and he believes that wherever this process is allowed to continue, the populations are doomed to collapse. The fish are "severely overexploited in many areas throughout their range," Stewart said. The species are listed as endangered under the Convention on International Trade in Endangered Species of Wild Fauna and Flora, yet they are not listed as endangered in many countries, including Brazil. Several thousand per year are harvested legally, said Stewart. However, illegal harvest continues throughout the range because of the high value of the species, and poachers usually are not caught. Stewart said it was necessary to identify the new species to help people understand the differences among them, set the fishes' natural history straight and support conservation efforts. Since the fish need to reach the surface to breathe, they are easy prey for hunters, but this trait also presents an advantage to researchers. One of Stewart's graduate students worked with indigenous people in Brazil counting the fish for a population census. This can give residents an understanding of how many fish to harvest in order to maintain the population. At one time in Guyana, there were estimated to be only about 800 fish in the research area. Conservation programs were implemented from 2001 to 2008, and the population climbed to more than 5,000. When those efforts were reduced, however, the population began to drop again. The only area where Arapaima did not decline is one supporting ecotourism, which facilitates conservation efforts. Recovery of populations requires restrictions on harvesting juveniles and fishing during the spawning period, and limiting the size of the catch. Stewart discussed extinction as a threat to Arapaima, especially because scientists are unaware of the number of species due to a lack of species taxonomy, or a classification system for the fish populations. Currently, the Arapaima has an average density of only about 0.3 fish per square kilometer in some areas of the lower Amazon. "You can round that to zero," said Stewart. "There is clear evidence of extinction for some local communities, and that is the beginning of a process that can lead to global extinction." He emphasized the need for conservation to protect the species and give scientists time to better understand the data. "We need a lot more taxonomic and genetic studies before things go over the hill," he said. Arapaima aquaculture could be a successful business opportunity, but the lack of knowledge presents a challenge. Different species might require different water chemistries, have different growth rates and have a different taste. "If we lose species, we lose the chance to find the species that might work best [for aquaculture]," said Stewart. He ended the lecture with a cautious word of advice: "Beware of conventional wisdom, what we know might be completely wrong." Stewart plans to go to Peru in September to continue his research.